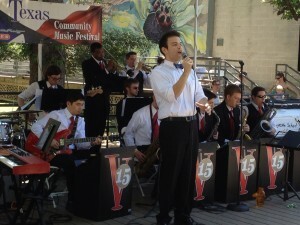 The Vintage 15 perform big band jazz and swing TONIGHT at the 2013 TCMF 8.1 showcase of community music! Austin — Texams Community Music Festival 8.1, our first ever Fall Showcase, kicks off TONIGHT AT 5:30pm, rain or shine! Them Blue Skies, who include festival coordinators Kathleen Brotherton and Herb Holland, will be first up, followed by the Jazz and Blues stylings of Candace Bellamy at 6:45 and finally culminating with the exciting Vintage 15, one of the most dynamic big bands in Central Texas. The weather forecast for tonight calls for a 30% chance of isolated showers. That means we will either be playing out in the patio at Central Market, as usual, or under cover on the deck. Either way, the show will go on! The food and drink will be delicious and plentiful, and of course, MUSIC WILL RULE! So bring the whole family out to Central Market North this afternoon for the first of five straight days of fabulous community music!